Measurements: 3.5 x 5.5 inches, or 90 x 140 mm. Back of card: Fuzzy orange sunburst with three orange swirls in the center, in a Celtic arrangement. Can be inverted if you're not fussy. Book included: Yes, 144 pages, hardcover. Dimensions: 7 x 8 inches, or 17.5 x 20.6 cm. The back of the box says there's only 128 pages, a misprint. Lavishly illustrated in color. Publisher: Destiny Books. Printed in China. These seasons are not according to the traditional solar calendar. Celtic winter starts October 31. Celtic spring starts January 1. Celtic summer starts April 30. Celtic fall starts July 31. I really don't know where they get this. I've seen snow in London in mid-April, a rather heavy snow. The court cards are Woman, Warrior, Queen & King. Of course many tarot decks are designed along these lines. This is one of the few decks to make that design explicit. 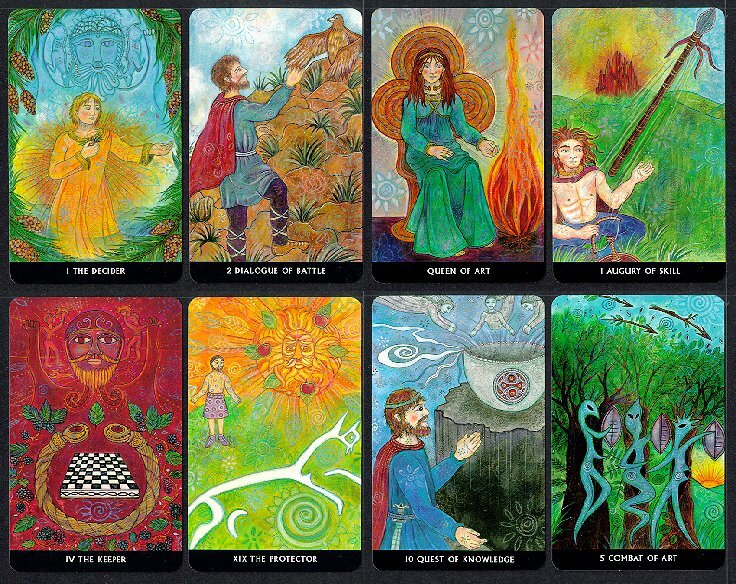 With the Soul/Fool standing aside, the remaining 21 Wisdom cards are also arranged into the Seven Candles of Life, each composed of 3 Wisdom Tarot cards (triads). For example, the Candle of Growth is composed of the Shaper, the Spinner & the Dreamer. There is also the Triple Spiral of Revelation, made up of three individual spirals: Wisdom cards 1-7, 8-14, and 15-21. There are also guidelines for meditation, including one that requires a full year to complete. All in all, a most interesting deck.